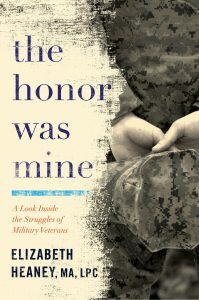 When therapist Elizabeth Heaney left her private practice to counsel military service members and their families, she came face-to-face with unheard-of struggles and fears. Emotions run deeply—and often silently—in the hearts of combat veterans in this eye-opening portrait of the complex, nuanced lives of service personnel, who return from battling the enemy and grapple with readjusting to civilian life. Presenting the soldiers’ stories—told in their own words—as well as her own story of change, Heaney offers an intimate perspective, not of war itself but of its emotional aftermath. Some of these stories scrape the bone; others are hopeful, even comical. Every one reveals the sacrifices of those on the front lines and the courage, grace, and honor with which they serve.